When embarking on a do-it-yourself home renovation project, you may wonder how much does a sheet of drywall weigh? While it may look flimsy, a stack of sheets can quickly add up in pounds. Drywall is typically used to construct interior walls and ceilings. Aside from very old buildings, it is very likely that drywall covers the interiors of your home, office and many retail stores that you visit. 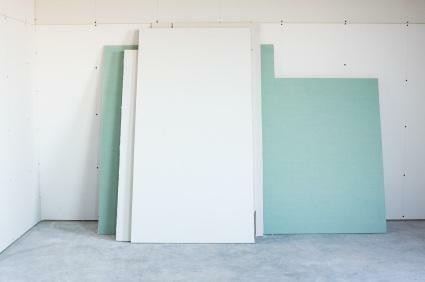 While the correct technical term for drywall is "gypsum wallboard," it is commonly and incorrectly referred to as Sheetrock, which is a trademarked brand. Drywall is made of gypsum plaster, which is finished with a sheet of paper on each side. It is kiln tried to seal the paper and harden the panel. Finished panels are typically four feet wide and eight feet tall in the United States. Larger panel sizes are also available, including four feet by ten or twelve feet. The weight of a sheet of drywall is affected by the factors listed above, such as thickness and construction. For a frame of reference, standard 1/2" drywall that is used in interior residential construction generally weighs about 1.6 pounds per square foot, totaling 51.2 pounds for one sheet. A 5/8" sheet of drywall, which is used to achieve fire ratings, typically weighs a little over 70 pounds. Also, depending on their dimensions, special types of drywall including moisture resistant products are often even heavier. Four by twelve feet panels can weigh as much as 125 pounds! Purchase the thinnest drywall that is appropriate for your job to avoid over-spending and potentially injuring yourself. Ask the supplier to drop your stack of drywall off as close as possible to the location where you will be installing it so that you don't have to carry sheets long distances. If you must move several sheets at once, use a hand truck or dolly. Move only one sheet by hand at a time to avoid injury. Two sets of hands are better than one. Enlist help to move your drywall sheets so you are responsible for only one end, which will also help prevent damage to the delicate corners. Use a drywall lift or jack to install the drywall, especially when working alone. If you are inexperienced with hanging drywall, ask a drywall-savvy friend to help out or hire a professional.